Comfortably nestled into the grounds of a farm amongst the Dorset hills this cottage is perfect for quiet couples break. 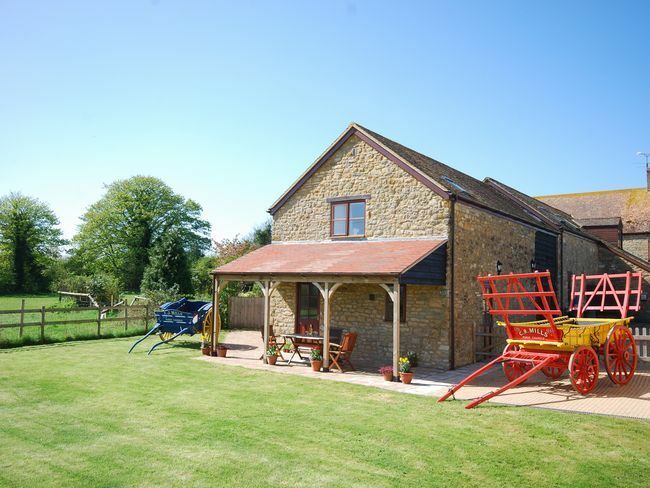 With the picturesque rolling hills and dales of Dorset right on your doorstep these cottages are perfect for anyone with a love of the outdoors and great rural walks. The quaint market towns of Shaftesbury the Gold Hill and Gillingham are both within a 5.5 mile radius. With an abundance of shops pubs markets and wonderful walks you ll be spoilt for choice on your holiday. Stepping through the front door you ll find a welcoming open-plan lounge/kitchen/dining area. The kitchen comes complete with all you need for a self-catering escape to the country including an electric oven and hob fridge / freezer compartment and a washing machine. The lounge area has ample comfortable seating a nest of coffee tables and a TV/DVD to relax and enjoy your favourite films and TV shows on. Upstairs you will find the bedroom with a king-size bed and an en-suite bathroom complete with shower over bath and WC. The property has a night storage heating system for cosy evenings in. Outside there is a rustic patio area with outside seating and a gorgeous view of the Dorset countryside. Home to one of the largest collections of private horse-drawn vehicles in the UK there are two examples adjacent to the property for you to enjoy.